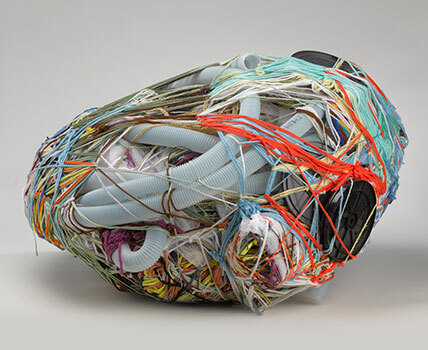 Judith Scott—Bound and Unbound is the first comprehensive survey of Scott’s work in a fine arts museum. This retrospective exhibition includes an overview of sculptural objects spanning nearly two decades of the artist’s career, as well as a selection of previously unshown works on paper. Scott was born in Columbus, Ohio, in 1943 with Down Syndrome. In 1987, after many years of living in isolation within an institutional setting, Scott was introduced to Creative Growth—a visionary studio art program founded thirty-five years ago in Oakland, California, to foster and serve a community of artists with developmental, mental, and physical disabilities. For the last eighteen years of her life, Scott created extraordinary and idiosyncratic objects—fastidiously assembled, fragile structures of found and scavenged materials that radically challenge and resist our attempts to define or rationalize them as sculpture. Judith Scott—Bound and Unbound is organized by Catherine Morris, Sackler Family Curator for the Elizabeth A. Sackler Center for Feminist Art, Brooklyn Museum, and Matthew Higgs, artist and Director of White Columns, New York.